Status: Accepted for publication in Astrophysical Journal Letters. Galaxies can grow in two ways. They can collide in violent mergers that combine the mass of two galaxies. Mergers turn orderly spiral galaxies into jumbles of stars called elliptical galaxies. Just such a merger is in store for our Milky Way and the Andromeda Galaxy in 4 billions years. Isolated galaxies grow in a more gentle fashion, feeding on inflowing gas from the cosmic web. 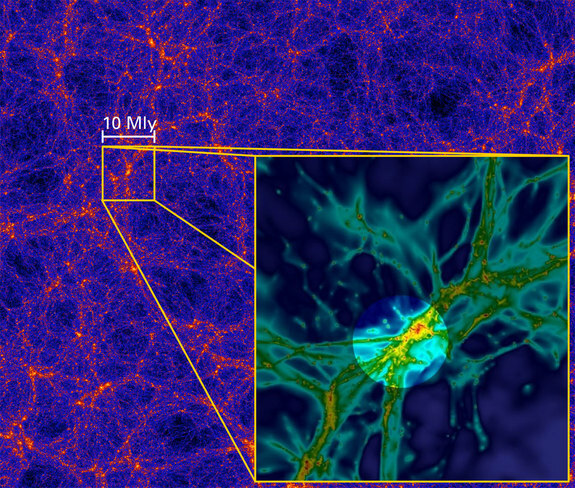 The cosmic web has been described by simulations of the dark matter and gas in the universe (Figure 1). The inflowing gas is difficult to observe directly; it is cold and has not yet formed stars. This pristine gas reservoir is studied indirectly by using distant quasars as lighthouses to probe the gas in front of them. Today’s paper presents observations of a handful of small galaxies to shed light on how infall of gas from the cosmic web can trigger the formation of new stars. The authors focus on ten small galaxies, known to contain very few metals. In astronomy, all elements heavier than hydrogen or helium are called metals. Metals are formed in stars, so the amount of metals in a galaxy represent the amount of star formation that has taken place. Thus, these galaxies have undergone very little star formation. The authors took new spectra of these galaxies to see if the amount of metals varies from point to point within each galaxy. Each galaxy’s light is dominated by a single region of active star formation, called a starburst. In Figure 2, the amount of metals in the starburst is much lower than the metal abundance. The same is true for the other galaxies. Because of its low metal abundance, the gas in the starburst has not experienced as much prior star formation as the rest of the galaxy. This discrepancy in metal abundance between the regions of most active star formation and the rest of the galaxy can be explained by infall of metal poor gas from a nearby filament. Figure 2. Top: Image of one of the galaxies studied. The bright blue dot is a star forming region. 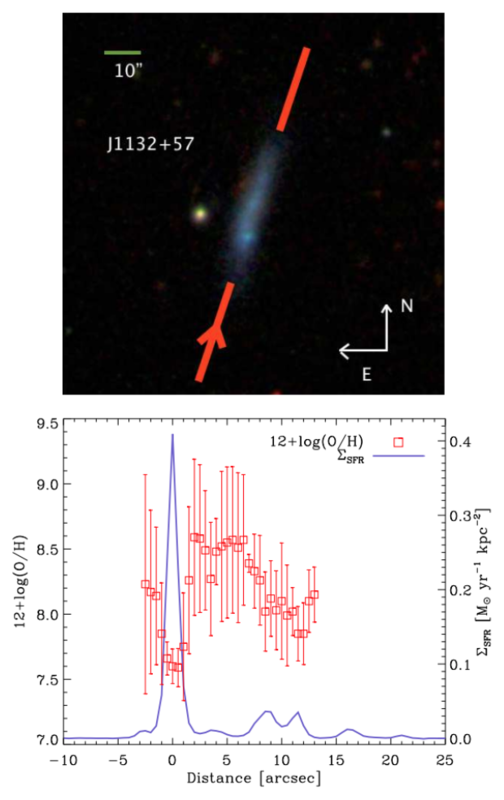 Bottom: Logarithmic metal abundance (red squares) and the density of the star formation rate (blue line) along the galaxy. The distance increases in the direction of the red arrow in the top panel. The star forming region has much lower metal abundance than the rest of the galaxy. Fed by a Cosmic Filament? Because of the small size of the galaxies, their rotation will quickly mix their gas, and the metal abundance should become constant across each galaxy. In order to maintain its lower metal abundance, the starburst must be tapping into a reservoir of gas with few metals. The infall of pristine gas from a filament is a natural explanation for the observed metal content. Such gas is part of the primordial cosmic web, and has not been enriched in metals by star formation. 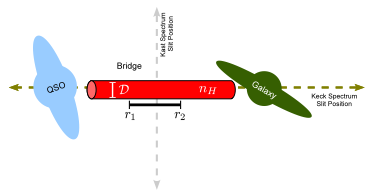 In this scenario, a gas clump in a filament collides with the galaxy and compresses its gas, triggering gravitational collapse and star formation in the diluted gas. These observations provide the best evidence yet that galaxies can grow by gas infall along filaments. I am a 4th-year graduate student at Yale, where I work with Héctor Arce on the effect of stellar feedback on nearby molecular clouds. I'm a proud Indiana native (ask me what a Hoosier is), and received my B.S. in astrophysics from Indiana University. If I'm not working, you'll probably find me on a trail or at a concert somewhere.